Cedar shakes and shingles have protected homes in the Pacific NW for hundreds of years. 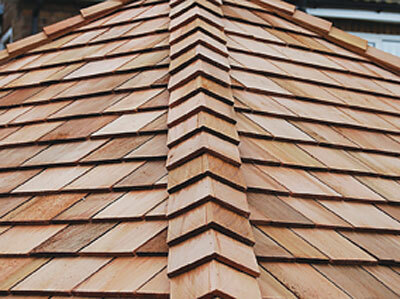 To many homeowners it’s still the best and most attractive of all roofing products. Even though the residential cedar market is only 2.3% of all sloped roofs, Cooper Mountain Roofing realizes that the request for shakes still remains. Shake roofing offers a natural look and has a character all its own. Even though the market demand is low, when it is requested, the ability to find quality wood can prove difficult. Because of the years we have been in business installing shake roofs, we have established relationships with many NW mills. This allows us to pick the best available cedar in the market. Cooper Mountain Roofing takes pride in its shake roof application and trains all its applicators the fundamentals of how shake roofs work and why installation is paramount to a long lasting installation. Knowing this, you can be assured our shake roof applications are some of the best in the industry. To understand more on what makes a great installation, or to talk about the many choices in product selection, call one of Cooper Mountain Roofing’s shake roofing experts for an in-depth explanation on shake products available and installation techniques.